Austin College, a private, four-year liberal arts college, has faced an increase in competition to enroll biology and pre-med students. Historically, Austin College has enjoyed an excellent reputation in the sciences and has been known as the “goto” school in the region for pre-med. Aggressive positioning from regional and out-of-state universities has caused Austin College to plateau in enrollment from its primary market. It has become increasingly more challenging for Austin College to compete with the incentives competing institutions are offering to target students. How could it reignite the foundation for enrollment growth it once had, all while maintaining quality in its academic profile? “We have a desire to grow enrollment in an increasingly competitive marketplace,” said Nan Davis, vice president for institutional enrollment at Austin College. 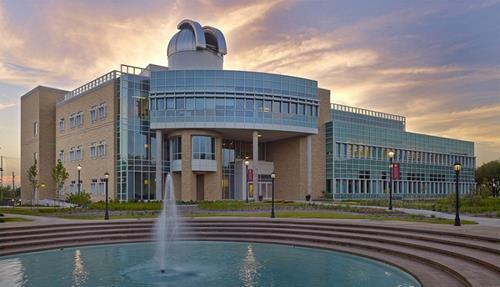 While the college was still generating good general interest in enrollment, it was not generating enough interest in biology and premed— despite research and internship opportunities, a new science building, and new scholarships and grants for students interested in biology. 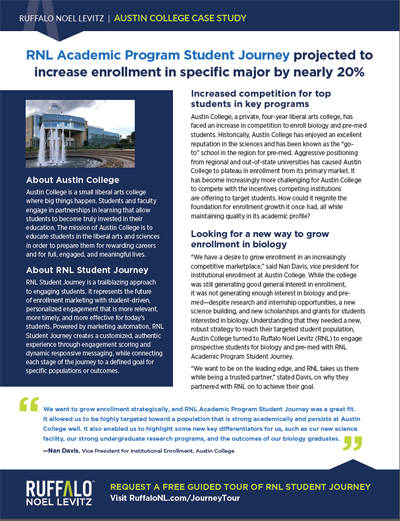 Understanding that they needed a new, robust strategy to reach their targeted student population, Austin College turned to Ruffalo Noel Levitz (RNL) to engage prospective students for biology and pre-med with RNL Academic Program Student Journey. “We want to be on the leading edge, and RNL takes us there while being a trusted partner,” stated Davis, on why they partnered with RNL on to achieve their goal. Powered by marketing automation, RNL Academic Program Student Journey matches the natural flow of student-driven engagement, using relevant dynamic content and engagement scoring to deepen the bond between Austin College’s biology program and prospective students and parents. Integrated Experience—Emails, text opt-in, digital ads, and landing pages. Real-Time Behavioral Engagement Scoring, which allows the college to see which students are more engaged as they conduct their explorations. Responsive Interactive Exploratory Hub—Curates relevant content dynamically based on student choices. Parent Engagement—Includes an interactive Parent Hub and communications. Academic Fit Finder—A quiz to determine what the student is passionate about and guides the content of their journey. *Represents RNL Academic Program Journey projected outcomes. After running the RNL Academic Student Journey for just two weeks, Austin College saw immediate results. First, the team noticed a huge uptick in website traffic during the journey. Compared to the same time period in 2016, there was a 122 percent increase in traffic to the correlating academic program pages. Based on engagement scores during the journey, RNL projects that their incoming freshman class for biology majors will increase by nearly 20 percent in 2018, netting an additional $148,500 revenue in 2018-19 and an additional $594,000 in revenue over four years. See how you engage more students for specific academic programs or in new markets. Ask for a free guided tour of RNL Student Journey and discover how you can create a self-directed student journey that will help you meet your enrollment goals.